For the last decade, Adam has been Gwen’s partner in defying the odds. Through the years when Gwen was constantly misdiagnosed, Adam devoted much of his time to researching medical conditions, healthcare options and lifestyle approaches as a problem-solver to determine the best course of action for Gwen’s health. 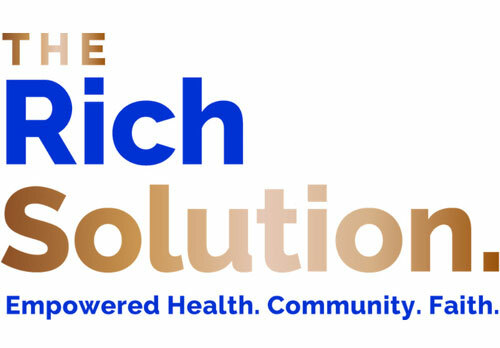 Since her correct diagnosis, he has not only supported her efforts in creating luck for herself by taking small but significant actions to improve her health and her mindset, he has teamed up with her to build the Rich Solution Community. 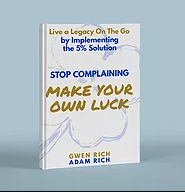 It’s become Adam’s passion to make sure that the world can benefit from Gwen’s message of actionable hope, and put into place her personal survival system for creating luck, improving health and building a legacy- on-the-go. Adam was born in Terre Haute, Indiana, in 1963. His family then relocated to Indianapolis, where his father did his medical training at Indiana University. Adam’s father served in the United States Air Force, in Cheyenne, Wyoming, as a physician on the home front, at the end of the Vietnam War. In 1973 the family moved to Sacramento, California, where Adam grew up. He graduated from UCLA in 1985 with a BA in psychology and with an additional focus on business administration. Following graduation Adam flew to Chicago to visit a college roommate who was working on the floor of the Chicago Board Options Exchange. The dynamics of the trading floor really grabbed Adam’s attention, and his former roommate told him that if he could raise some money he would teach him how to trade. On returning to Los Angeles, Adam raised some money, packed up everything he owned into three boxes and sent them out to Chicago. From there he lived on his buddy’s couch for a few weeks before he was able to get a place of his own. Adam began trading on the floor of the CBOE in 1985. He met his wife Gwen in the spring of 1987 on the trading floor six months before the stock market crash, which he barely survived, professionally speaking. Adam and Gwen married in the winter of 1989. Adam traded at the CBOE for roughly 15 years before he moved across the street to the Chicago Board of Trade and formed, Redmann & Rich, a trading group specializing in the soybean crush trade in the grain room. Adam and Gwen have four children, each pursuing their own career paths. Their eldest son Teddy is pursuing a career in nursing. Their daughter, Rachel, a 2015 graduate of the University of Kansas is working as a critical care paramedic. Max, a 2017 graduate of the University of Kansas is currently applying to medical schools and Danny is completing his senior year at the University of Kansas studying mechanical engineering – Rock-Chalk-Jayhawk! After Gwen‘s cancer diagnosis in 2012 the couple struggled to find meaning and purpose with the time they had left together. Ultimately through trial, error and research regarding Gwen’s ongoing cancer battle, they developed a strategic plan of action that has paid off in Gwen’s becoming one of the 25% of people who survive her particular cancer beyond their planned expiration date. In the process they developed the 5% Solution, seeing that what worked for Gwen would work for others as well, regardless of their health. It turned out that Gwen and Adam had made their own luck by being determined, observant and willing to seize on opportunity. This is the basis for the 5% Solution – and their shared passion for helping others live their legacy and create a richer life. The family currently resides in Deerfield, Illinois.